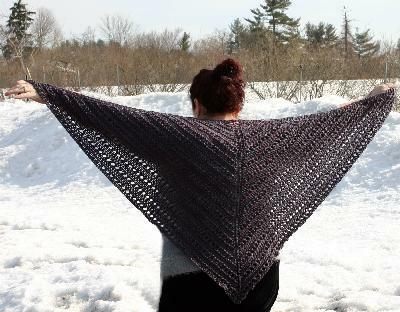 Beautiful and practical, this easy to knit lace shawl is a straight forward knit in Ivy Brambles Superwash Worsted Yarn. Works up quickly on a size 9 needle. 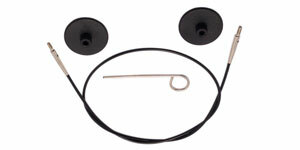 Needle: US 9 (5.5 mm) 40+ inch circular or as required to meet gauge. Ivy Brambles Superwash Worsted Yarn #130 Elegant BlackIvy Brambles Superwash Worsted Yarn is a deliciously soft hand dyed worsted weight yarn that is machine washable (cool) and dryable (low heat) designed for sweaters, baby garments and accessories desiring a worsted yarn. This is truly a spectacular yarn! Copyright © 2019 Knitting with Friends, CYDJ Designs, Inc.